My Stellar’s Jay Sweater is roughly based on Elizabeth Zimmerman’s EPS (Elizabeth’s Percentage System) sweaters. EPS sweaters are based on the idea that the size of someone’s arm is roughly proportional to their bust size, which is roughly proportional to their neck size. It’s not perfect for people with more unusual body types, but I’ve found that most people can make the EPS work for them on the whole. It’s a great basic sweater recipe that you can customize, tweak and otherwise futz with to make yourself the sweater you’ve always dreamed of. 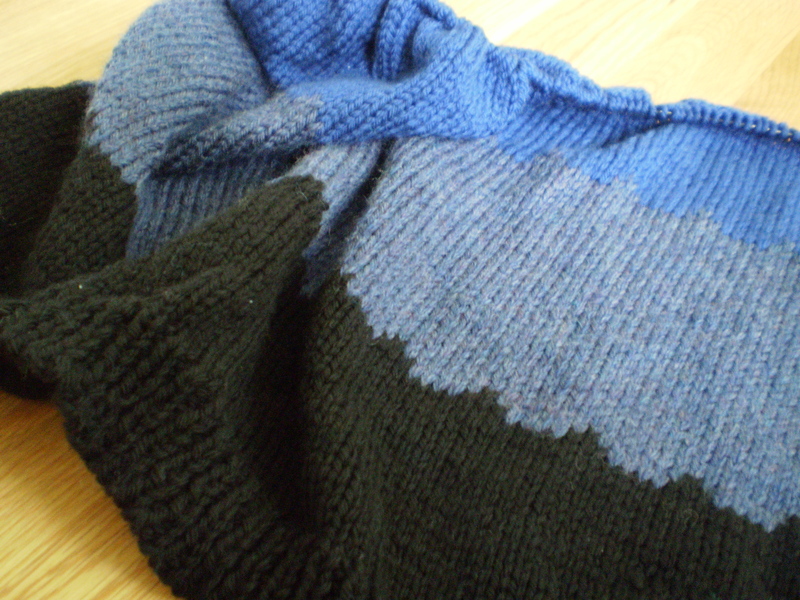 My Stellar’s Jay Cardigan is knit from the bottom up, which means that make the body first, from hem to armpits. Then I cast on the sleeves at the cuffs, and knit up the arm. Then I slowly increased (increasing 2 stitches every 8 rows in a line along the inside of the arm) until I reached 64 stitches, which was my planned upper arm measurement (about 35% of my torso measurement). Then, I knit along, without any more increases, until my sleeve was long enough for my arm. The result was a gently tapered sleeve, that perfectly fit my arm. The next thing to do was to join the arms to the body. This entry was posted in Techniques and tagged arm, cuff, Elizabeth Zimmerman, eps, EZ, increase, knititng, stellar's jay cardigan, stellar's jay sweater, sweater, tubular cast on on August 8, 2014 by onemilljellybeans. 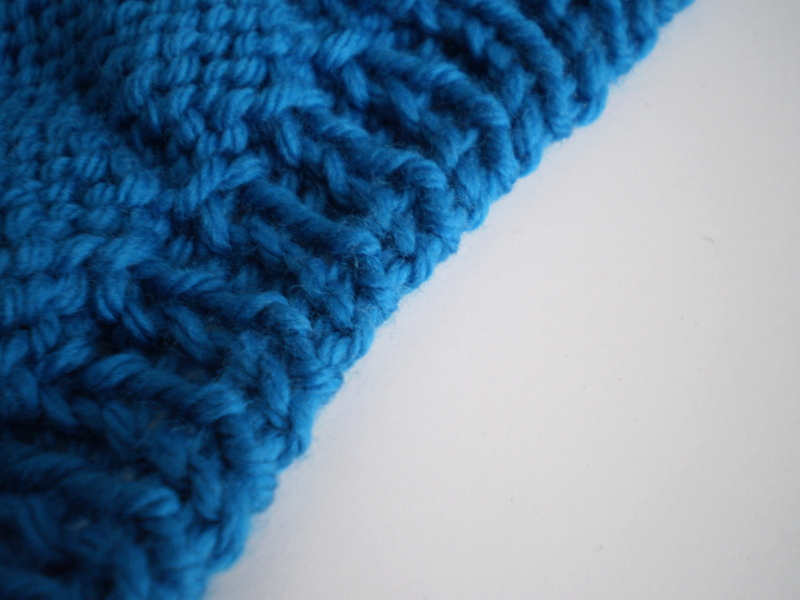 On Friday, I waxed poetic about the tubular cast-on and tubular bind-off. How they look the same, how they’re perfectly stretchy, and how they are ideal for cuffs and collars. But, I didn’t show you any examples. Now, it’s time for me to put my money where my mouth is (metaphorically speaking. I don’t have enough money laying around to just start eating it). Behold, the hem and the collar of my (almost finished) Stellar’s Jay Cardigan. See how they match perfectly? The k1p1 ribbing makes a lovely subtle edging, and the tubular cast-on/bind-off stops the sweater from pulling even a little bit. 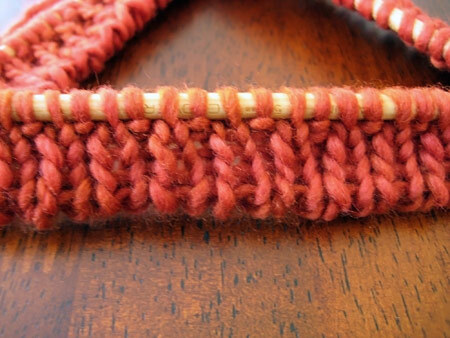 Sure, my perfect edges are something that only an obsessive knitter would notice, but as a slightly obsessive knitter, they’re something that makes me very happy. 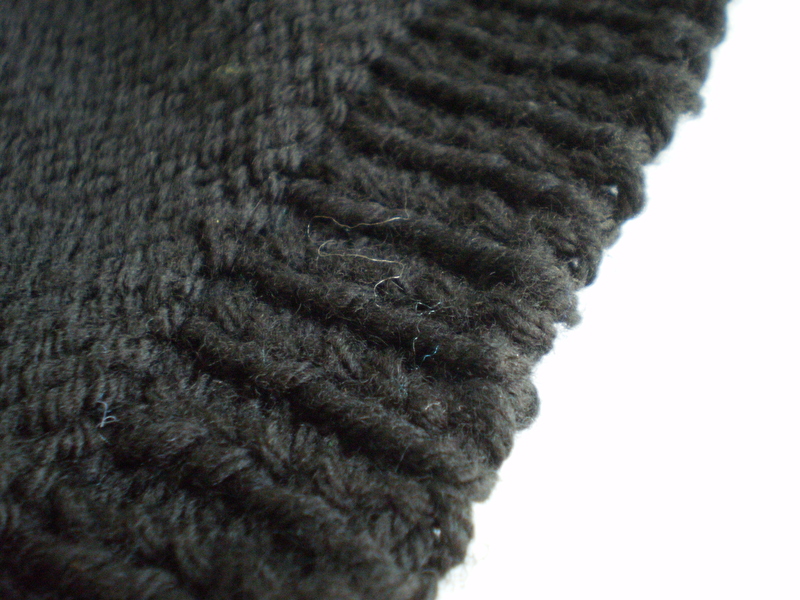 This entry was posted in Techniques and tagged cardigan, collar, cuff, cuffs, hem, ribbing, stellar's jay, stellar's jay cardigan, stellar's jay sweater, tubular, tubular bind off, tubular cast on on August 4, 2014 by onemilljellybeans. 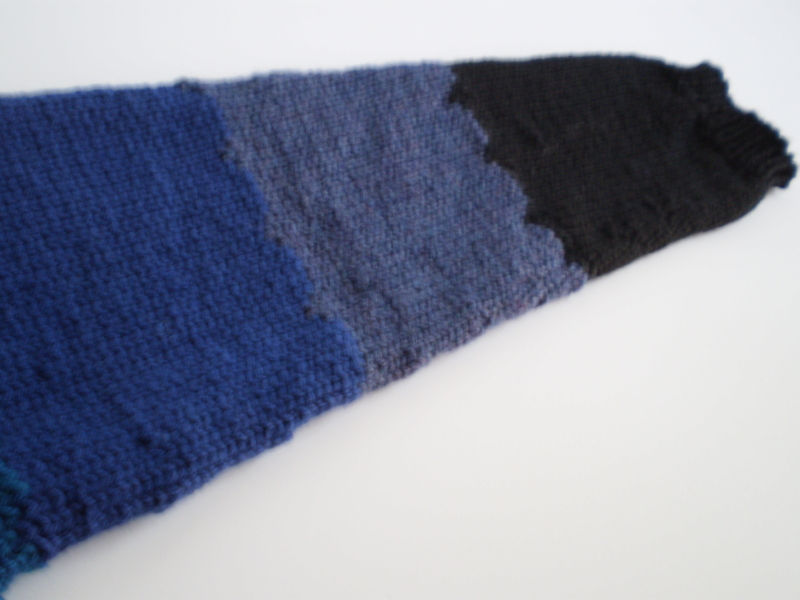 Nine times out of ten, when I cast on for a project, I use a basic long-tail cast on. But sometimes, if the Knitting Gods so move me, and if the project is really special, I like to break out my Tubular Cast-On. It’s absolutely gorgeous, especially paired with fine ribbing (it’s perfect with a 1×1 ribbing on sock cuffs). Properly executed, it looks like the stitches on the front of the piece simply swoop around the edge and continue on the back. And (double bonus! ), it is super stretchy, so you don’t have to worry about weird tension issues that sometimes happen at cast-on edges. There are a couple ways to do it, which have all been written about online many, many (many) times. The way I learned, is apparently the “Italian Way.” Who would have thought? There’s a great tutorial for it here. There’s another way to do a tubular cast on, that frankly, looks much easier, but I haven’t tried it, so you’ll have to give it a shot and let me know how it goes. Here‘s a tutorial that looks pretty good. What kinds of cast-ons do you like? 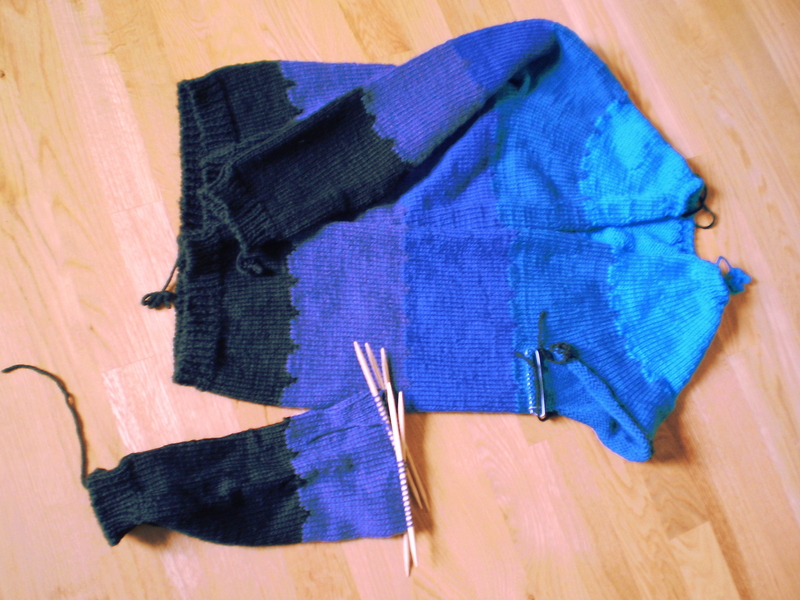 This entry was posted in Techniques and tagged cast-on, cuff, knitting, provisional, stellar's jay sweater, tubular, tubular cast on on May 30, 2014 by onemilljellybeans.